In the modern-day NFL, modesty isn't exactly common. Spiking the ball turned into touchdown dances. Touchdown dances turned into a sharpie in the shoe. A sharpie in the shoe turned into a hidden cell phone. That paved the way for sack dances, emphatic first downs (whether or not it even was a first down) and all manner of BS that makes you forget you're watching the "toughest game" on Earth. Sometimes you have to ask the question: How did we get here? If watching a routine TD in the NFL didn't turn into rehearsed theatricals worthy of Broadway then maybe the brass wouldn't order a league-wide crackdown. Humble men need not apply as we pay tribute to the few who've gotten some karmic retribution. Though some of these entries are innocent bystanders, their place in the TD-crossfire deserves documentation. Simply handing the ball to an official would go a long way. 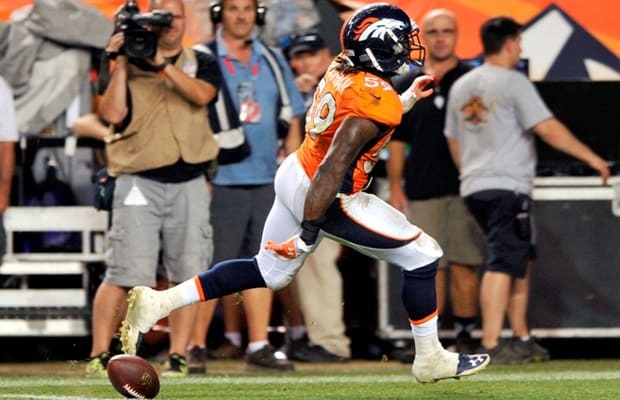 Just ask Danny Trevathan, who had a DeSean Jackson-type fail last night. Luckily the Broncos already had the game won. These are the 25 Worst Touchdown Celebration Fails.